The first thing that you notice is the "cloud area" which is supposed to serve as a "dynamic support/resistance zone that prices tend to bounce off of". While Ichimoku utilizes five separate lines or components, they are not to be used individually, in isolation, when making trading decisions, but rather used together to form an integrated "whole" picture of price action that can be gleaned "at a glance". Thus, a simple look at an Ichimoku chart should provide the Ichimoku practitioner with a nearly immediate understanding of sentiment, momentum and strength of trend. Tenkan Sen/Kijun Sen Cross: This is similar to any moving average crossover system. When the blue line crosses above the red line from below, it is a buy signal. When the blue line crosses below the red line from above, it is a sell signal. Kijun Sen Cross: When price crosses the blue line from below it, there is a buy signal. When price crosses the blue line from above it, there is a sell signal. Kumo Breakout: The Kumo is the "cloud" or shaded red and green areas on the chart above. When price closes above the Kumo, it is a buy signal. When price closes below the Kumo, it is a sell (short) signal. Senkou Span Cross: This one is pretty simple. 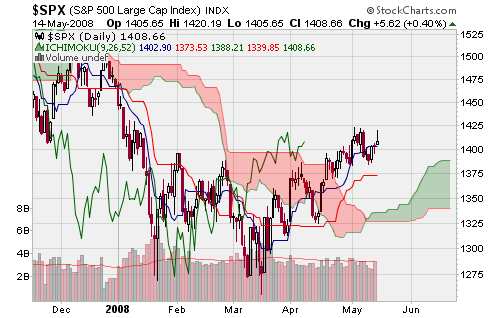 On the chart above you can see how the Kumo changes from red (bearish) to green (bullish) and vice versa. A buy or sell signal is generated when this change occurs. Chikou Span Cross: When the green line crosses through price from the bottom, it is a buy signal. When the green line crosses through price from the top, it is a sell signal. These charts are pretty cool looking but I am not really sure yet as to how effective they are. If you have some experience with this charting method, then please leave a comment or send me an email! 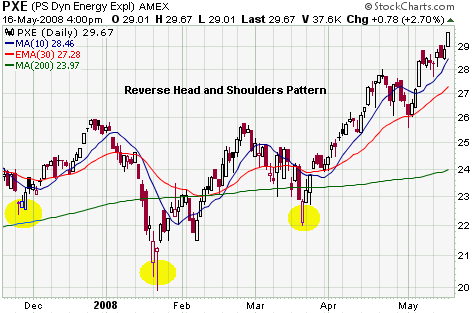 The first thing you notice is the classic reverse head and shoulders chart pattern. It has already broken out through the neckline. This stock is in a decent uptrend. 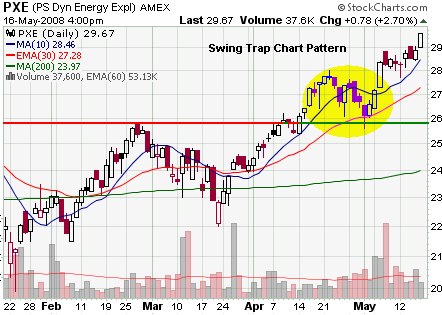 This stock pulled back into the TAZ and is at a support area. This is a Swing Trap price pattern. This is a T-30 price pattern. This stock pulled back to the 38% Fibonacci retracement level. It had 4 down days in a row (with lower highs). This stock had a bullish engulfing candlestick pattern. By looking at this chart we were able to combine a classic chart pattern (longer term outlook) with a smaller price pattern (medium term outlook), and then with a candlestick pattern (immediate term outlook). That's a lot of technical analysis on one chart! Your not always going to find such a beautiful chart. But when you do, you won't be able to enter in your order fast enough to jump on the train! The point here is that you ideally would like to see as many factors as possible going in your favor to increase your odds for a successful trade.